At Integrated Systems Europe 2019, Analog Way will introduce its new range of modular and scalable 4K/8K multi-screen presentation systems and videowall processors. Dedicated to high-end staging and premium system integration, the new platform will be showcased at Analog Way's booth 3-B130 via professional presentation sessions and demos, along with the company's other product lines of presentation systems, media servers and multiformat converters. 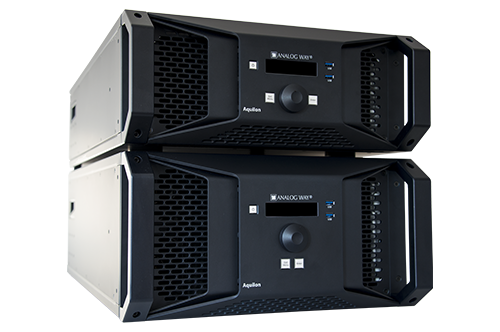 The LivePremier™ series is comprised of four high-performance pre-configured products: Aquilon RS1, RS2, RS3 and RS4. In addition, two fully customizable models, the Aquilon C and C+, can be tailored to match the requirements of any project or event. With ever-increasing video display sizes, 4K and 8K imaging, high dynamic range, high-frame rates, and rapidly-developing video and audio standards, the need for a forward-looking and highly adaptable video processing platform has never been higher. In response to this evolution in the professional audiovisual industry, Analog Way presents the most powerful 4K/8K presentation system in its category, with unique I/O capabilities and up to 120-megapixel throughput on Program outputs at 10bit 4:4:4, from a single chassis. Designed around a highly-flexible modular hardware platform, all the LivePremier™ Aquilon systems combine unmatched real-time 10/12-bit 4:4:4 video processing power, best-in-class image quality and pure 4K60p on each input and output with ultra-low latency. Their field-replaceable I/O connector modules allows connectivity to a variety of formats, including HDMI2.0, DP1.2, 12G-SDI and future potential formats such as single-cable 8K60 and IPTV transports. In its largest chassis configuration, LivePremier™ Aquilon offers up to twenty-four 4K60 inputs and twenty 4K60 outputs configurable as single screens, edge-blended widescreens or scaled auxiliary outputs, two dedicated 4K Multiviewer outputs, up to twenty-four 4K or forty-eight HD freely assignable layers, as well as powerful features for any advanced display configurations (custom output formats, output rotation, area of interest, bezel compensation, pixel pitch management…). Another unique aspect of the LivePremier™ Aquilon systems is their native Dante™ audio routing capability. It allows users to embed or de-embed up to 64 channels of audio over a Dante™ network transport, thus eliminating the need for external audio embedders and de-embedders. The LivePremier™ Aquilon systems are specifically engineered to perform to the highest standards in mission-critical applications and are road-hardened to survive frequent shipping and tough live events. By combining a heavy-duty modular design, the highest quality components selected for their reliability, and features such as redundant hot swappable power supplies and smart thermal management, they deliver uninterrupted 24/7 performance and peace of mind. For ease of setup and to ensure flawless control of multi-screen presentations, the LivePremier™ series features a totally new, cutting-edge HTML5-based user interface: the Web RCS, compatible with any device or platform including iOS and Android devices. Conceived to greatly increase productivity and reduce learning curve, the Web RCS offers dozens of unique features that simplify configuring and operating, such as live program/preview workspaces with high-resolution dynamic thumbnails of connected sources, multi-operator collaboration with password protection and user privileges, walkthrough guides, keyword search, multi-language support and much more. The LivePremier™ series is positioned above the LiveCore™ series of presentation systems and complements Analog Way’s Picturall™ media server range to offer an extensive choice of cutting-edge solutions for the most demanding audiovisual projects and installations.